watched the bolts scrawl across the night sky on my driveway. But when I was sleepily moping my way down to feed the chickens just like I do every morning, I had a quite a surprise when I looked past the barn to our high tunnel all torn apart by high winds. This was soon followed by me kicking a couple feed buckets and words I won’t repeat here. Although not the best development of the season, after I cool down, I always find the positive side. 1. 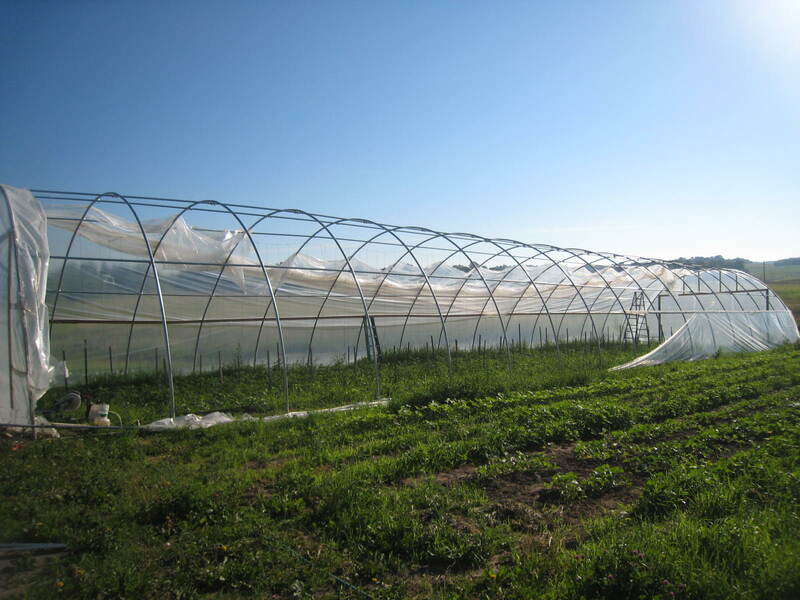 The frame of the high tunnel didn’t get blown away or damaged. 2. No hail. Maree and I thought hail would be a real possibility when the front hit. 3. Generally the crops are looking good this year-that’s what matters. Even the plants in the high tunnel weren’t damaged. I fully expect I can repair the plastic with greenhouse tape, a strong and clear tape used in situations just like these. Otherwise the rest of the week was fairly normal. I did spend last night haying our few fields with my neighbors even though I really should have rather been picking peas for the box. But when bales need to come in, they need to come in. It’s all ok with me, regardless, since it’s a job I always love doing. It’s one of the toughest jobs on a farm physically, but a person just feels good getting the bales stacked in the barn and nice and dry. A person also sleeps really well too. I told my neighbor Marv that I think anybody who currently needs sleeping pills for a good night’s rest find some baling party they could help out with. Arugula: The ones that look like little oak leaves. Napa Cabbage aka Chinese Cabbage: I thought I’d throw in a recipe video (below)…you really can’t go wrong with this by sauteing it. I like a basic recipe which is only cabbage, sugar, rice vinegar, and cayenne or red pepper flakes. Zucchini: Hey, first of the year. Braising Mix (colorful bunch of greens): Some last week, but this stuff is “ready” and wouldn’t last another week.